It's with great pleasure that we hereby inform the whole community of Total War Center that the latest MODDING AWARDS are now LIVE! 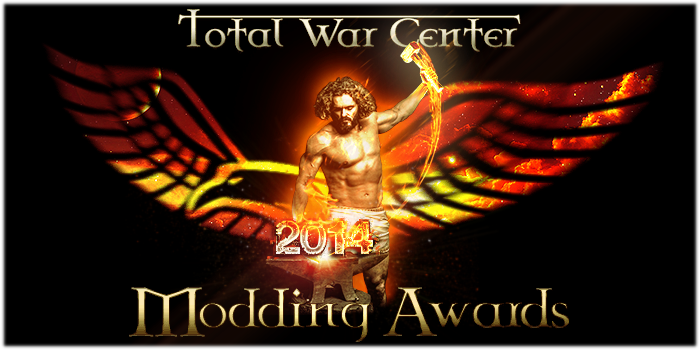 Esteemed fellow members and visitors, after a long wait we are pleased to inform you that the 2014 Modding Awards are now live and open for discussion and voting. On behalf of Total War Center, we kindly invite you to take part in the nomination and voting phases; everyone is welcomed to participate and to express his preferences with his vote. For your information, all the titles from Rome:Total war and up are represented, ending with those already released by 2014. The full list include Rome I, Medieval II, Empire, Napoleon, Shogun II and Rome II. For obvious reasons very old games (specifically, Shogun I and Medieval I) are not included, and similarly later titles (Attila) will not be included before the next edition of the awards. Each title has its own specific categories, which in general sum up to Favourite Modder, Best Mod/Submod and Miscellaneous; with the purpose of covering as much categories as possible there could be more of them in specific titles, but in general the goal is to provide the voters with a consistent choice for each category. As usual the initial nomination phase will last for two weeks, after that there will be the vote phase, then the official count and finally the most exciting part, the delivery of the Awards! As almost everybody knows, the modding community is central to TWC and still vibrant and alive after so many years, so we really hope many will take part in this vote: even the most simple and less known submod deserves a recognition, so that's a good chance for everyone to step forward and vote for their favourite modifications. While introducing the new Awards, I'd like to spend few more words about them: probably, not everybody knows that they are a voluntary task. There's no such a permament commitee to run them, nor any specific body of TWC is appointed to do so: as a matter of fact, anyone can volunteer to manage and take part in them, as long as one is a regular member; it does not matter if you are a Citizen, a member of the Staff or a 3 months registered new member, because everybody is invited to participate if they wish so, everything with the purpose to give the proper recognition to the modding community and to serve the site for the best. I also wish to point out that there will be no conflict of interest for any modder that might want to run them; actually, the bulk of the job is to collect and list all the mods/sumbods, modders and miscellaneous for each of the title taking part in the award, so it's a mere technical work in which no one will take any advantage and, in case something will be removed/not included, it's a collective decision of the whole Commitee (although very rare, usually all released works are taken into account). If anything, I have to say that modders are those who have the best knowledge of the community and mods of the titles they are modding themself, hence their contribution will be unvaluable, as they could speed up sensibly the whole process; anyone who tried this task, will know what a long and tiring job is to scroll, check and list all the mods, submods and such for each title (and don't forget the DLCs/Expansions too), so someone who is already well aware of the matter will add an invaluable contribution to the process. Finally, the recruitment of volunteers for the 2015 Modding Award is already open; please feel free to contact with Hader if you want to propose yourself for the role, the whole TWC will be grateful of your contribution and you will do a great service to the site by helping to run the 2015 shortly, so that we can keep the pace as the years go! Thank you to all of the volunteers! I look forward to seeing which mods and modders are nominated. Don't forget to nominate and vote! Thanks to the volunteers! There's a big overhaul project for Rome II, DeI, so this might be it's year. Almost every time during award nomination I found a new and interesting mod, which I have never heard of before. So it is definitely a chance for all minor, mini and submodders out there to present them self and receive a huge bunch of recognition, which everyone of them deserves for sure! However, I am not sure, why my name is mentioned above, since I only helped with one list? "Volunteer task""??? Damn, I've been mistaken!!! More seriously, that's my 1st participation in these awards organisation. I've been involved in this more than I firstly expected but I've done it with a great pleasure. As mentioned already by Neadal, it gives the opportunity to see mods/submods than we probably would never find because we don't necessary play all the TW series. Many thanks in advance and keep the good job up modders!!! I've never thought of that! Yes, I did the ame thing myself. I fixed it though. Technically, if we the awards were done on time, it wouldn't really be a problem. It was this time because you had to go back through a year of posts to see when the OP was updated last with the latest version. That was by far the most consuming part. That being said, however, it is a good idea to keep a recird of updates to let people know how often you do update the mod.